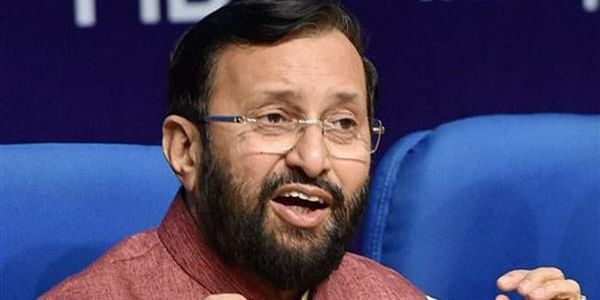 Union minister Prakash Javadekar today expressed confidence that the BJP will register a massive victory in the Gujarat assembly elections to be held next month. RAJKOT: Terming the opposition Congress as "anti-people", Union minister Prakash Javadekar today expressed confidence that the BJP will register a massive victory in the Gujarat assembly elections to be held next month. "BJP is very confident of winning the elections in Gujarat and it will register a massive victory on the basis of the work done by the government," the HRD Minister, who was here to take part in the party's door-to-door campaign, told reporters. "The important work that the BJP government has done in Gujarat is to bring the Narmada water to the parched regions of Saurashtra and the Kutch," he said. "This is a path-breaking work. The Congress has always tried to stop the Narmada project work. It (Congress) is anti-people and therefore people are with the (BJP) government, which has brought water to the region," he said. Under the project, drinking water from Narmada is being provided to 10,000 villages and 173 towns and cities in Saurashtra and Kutch regions, the BJP leader said. "It is (bringing Narmada water to the region) nothing less than a feat," he added. The minister claimed that Gujarat has always stood first in all the annual government surveys. It is number one in industrial outputs. It provides electricity 24 hours and its agricultural output, including that of fruits, vegetables, cotton and groundnuts, has increased under the BJP government. In a veiled attack on Congress vice president Rahul Gandhi, who is currently on a campaign tour in north Gujarat, Javadekar said, "They are moving in a bus, while we are in the hearts of Gujarati people." Hailing the GST Council's decision to cut tax rates on 178 items of daily use, Javadekar said, "People have welcomed the changes in GST."